it is not your job to carry the weight of the World on your shoulders. Who made you think that it was so? and your commitments became obligations. you forgot how to breathe, and how to move with the breath. Let that weight fall off of your shoulders. Move with the flow of the breath, in and out. Move with the beat of your heart. Let the fire in your belly move you. When you feel inspired, feel free to pick a ball back up. It is light, it is weightless, and it glows with the spark of your heart. Does it also sparkle with joy? Or does it weigh you down? juggle them; play with them; laugh them into existence. But everytime one drops, notice its weight when you pick it back up. If you can’t carry it, if it weighs you down, then let it go. You deserve to feel weightless and free. You deserve to be lit up by life. or lightly let them go (with love). 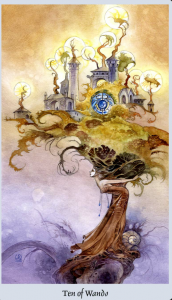 This entry was posted in Suit of Wands, Tarot Channeled Writings, Tens (fullness and completion).